MUFON CMS - Chicago, IL - 4/5/2010 - unedited: Looking over to the western sky in Chicago at night in April. I noticed a very small but bright flashing light of colors. I grabbed my 8MP camera with a 200MM Telephoto lens and took a few shots. I did my best to keep still but maybe the slight shift is me or the object. Either way the color are clear and the shapes are unusual. Didn't seem right to me when I checked these out on the computer. Took me awhile to share but I hope this helps. In the photo there are two samples of the same image on each photo. The top left is the original and the close up is about 400% zoom. Both are clear and beautiful. MUFON CMS - Tombstone, AZ - 10/17/2010 - unedited: My wife and I were down from Oregon for my sisters wedding in Tuscon Arizona on Saturday the 16th of October 2010. Sunday the 17th we drove out to Tombstone where they just by chance for us were having Helldorado days which was a lot of fun. As we were leaving Tombstone we stopped at Boot Hill cemetery just at the north end of town. After walking through the cemetery my wife and I were about to get into the car. I looked out over the road (HWY 80) toward the west to take in the scenery out over the desert. 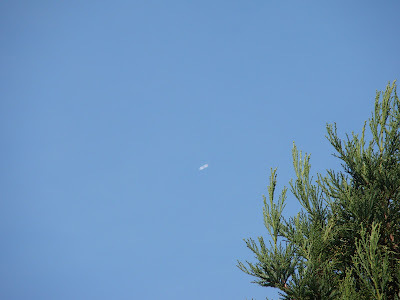 That's when I noticed something just hanging there maybe a mile or 1.5 miles high and about 3 miles total distance. It hovered and did not appear to move. It was a little difficult to see with the Sun facing me at about 2 o'clock with the object to the left at 9 or 10 o'clock. At first I considered it could be a hot air balloon but I quickly ruled that out. I thought the sun could be reflecting off of something but that would mean there had to be something there to reflect off of. 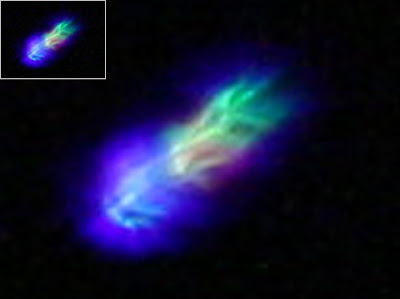 With the naked eye I could see the dark area on the left and the bright white vertical boomerang shape on the right. I grabbed my camera and took about four pictures, the one I posted is the best image. 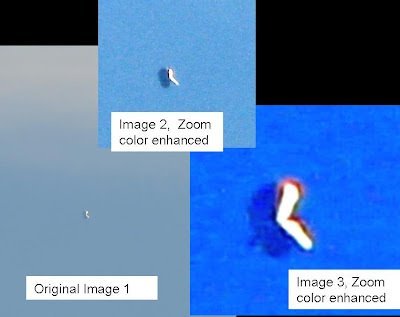 These images were able to provide much more detail than I could see otherwise. 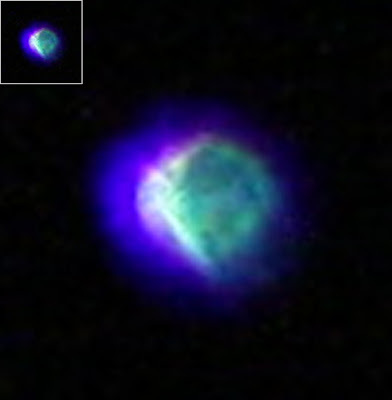 My wife also could see the object as well. With no nearby roads leading out to the object and not knowing what it was we decided to leave after watching it for about ten minutes. During that time it did not appear to move, if anything it got a little closer. MUFON CMS - California - 10/25/2010 - unedited: I stepped out on my back porch to drink my morning coffee of which I always do every day just to take in a bit of the morning sun. I always look up to the sky just to observe the sparrows in the trees and the Honkers of which there are a lot of this time of year. As I scanned the blue sky I noticed a bright white object coming from North and heading south. I immediately thought "how strange this object looked". 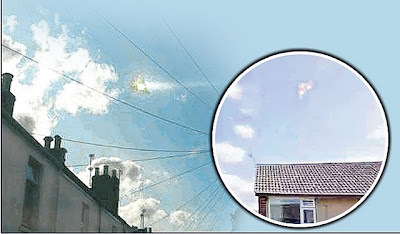 It was a bright white yet transparent looking object. The front and back were rounded just like a long tube. 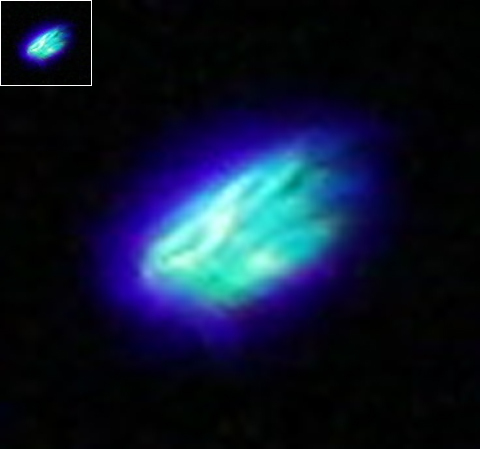 There was a slight discoloration (slightly darker than the bright white/transparent color of the rest of the object) in the middle which gave it the appearance of a band around it. I listened for "sound" but heard none but I also know that you can't always hear a planes engine until they have passed over you somewhat. I learned this because I see a lot of commercial airliners. I knew immediately this object was different because I couldn't see any wings, tail, windows, or a jet stream. It also seemed to move with more ease like it was gliding. I can't explain why I felt that way except maybe because there was no sound. I remembered my camera was on the table so I ran in the house and grabbed it (coincidently it was sitting on my kitchen table because I had been loading my vacation pics into my laptop that morning!) When I got back out on the porch, less than 10 seconds, I noticed it had moved very fast and my nerves kicked in. I felt I needed to just start snapping photo's or else I was going to lose it. I snapped only 3 frames before it was out of sight. I only caught one good enough to show what I saw and I am pleased. I listened for the "sound" again but heard nothing. It seemed to be heading south but also "up" and it disappeared rather into the high sky before I could blink. thesun - A UFO hovers over rooftops - leaving locals believing aliens travelled across the universe to check out their lives in Rotherham. Baffled residents helplessly SHOUTED at the triangular craft as it crept above the South Yorkshire town. 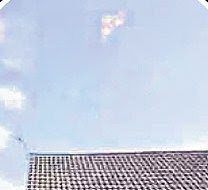 Eerily it looks just like an object spotted over Belgium in 1990 - which so spooked authorities that F-16 fighter jets were scrambled to intercept it. Nayab Ahmed, 19 - whose pal Anny Cummings, 18, took the snap - said: "It moved really slowly but occasionally it'd shudder. It was completely silent." Another witness said: "I don't believe in aliens, but what else could it be?" Nick Pope, ex-head of the Ministry of Defence's UFO unit, said: "Some might suspect secret prototype aircraft and drones, but we test such craft in restricted military areas, not built-up places."